A mark of a great book is when I finish reading it and get pissed the next one isn’t immediately available. 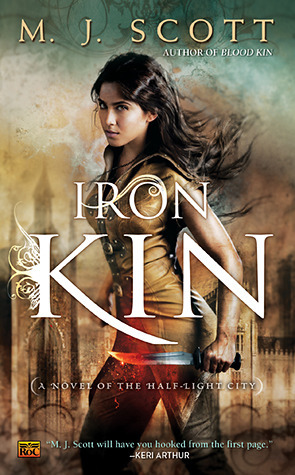 In Iron Kin we return to the Half-Light City and the DuCaine family. Saskia’s a metalmage and the oldest daughter, escaping the trappings of marriage only due to her studies. She meets Fen, a Beast/Fae/human mongrel, in a chance encounter at a ball thrown by her mother. The two are intrigued by each other, but Saskia’s determined to stay away from romantic entanglements until she’s achieved her goal: to be named one of the Guild’s delegates in the upcoming treaty negotiations. Fen, for his part, knows Saskia’s the kind of woman to stay away from, even before his friend Holly warns him off. But one touch brings Fen back into Saskia’s orbit, and leaves the two of them entwined, at least for the duration of the negotiations. Fen’s been blessed, or cursed, with the Sight, and as such, his Beast Kin family line wants to claim him, but only to use his powers. His visions are getting worse, though, so bad that the alcohol and iron he uses to keep them at bay don’t work anymore. Saskia’s affinity for iron somehow makes her touch the balm he needs. Need becomes crave, and Fen wrestles with the knowledge that he’s not the best candidate for Saskia’s heart. Saskia doesn’t fight her growing feelings for Fen. She lets them come, but doesn’t analyze them. Her casual attitude toward their deepening relationship allows Fen to let down his guard around her. He understands and respects what she’s capable of, and while he tries to protect her, he acknowledges that she’s capable of doing it herself, which is more than she gets from her brothers, Simon and Guy. Despite the old-fashioned philosophy surrounding the women of the Half-Light City, Saskia’s determined to be different. She’s strong, independent, and wants to be seen as an individual and valued as a person, not as a woman, and one who can handle the harsh truths of what’s to come. The events set in motion all the way back in Shadow Kin pick up speed here. The fragile treaty held together by the Veiled Queen’s law could fail at any moment, and there are those in the Night World who would see it so. 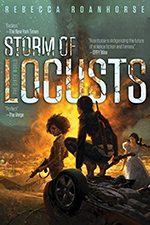 After the death of Lord Lucius, there’s a power struggle to rule the Blood Court, the Beast Kin are making alliances with the Blood, and the humans are the ones who stand to lose the most. The entire City’s on edge. It makes both Saskia and Fen feel a little guilty that they’re more concerned with each other at times than the greater good. The world of the Half-Light City is one you want to sink into. 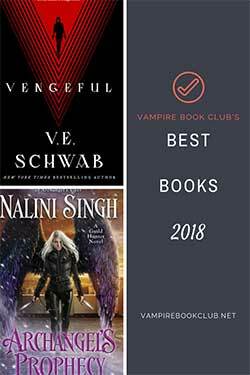 It’s a fantastical mix of paranormal and steampunk, populated by shapeshifters, vampires, fae, magically inclined humans, and those without any sort of supernatural enhancements. There are taverns and brothels, modistes and Templars, gas lamps and indoor plumbing. The Fae hold the balance of power simply by default of having the ability to kill everyone, their magic more powerful than the supernatural strength and violence of the Beast or Blood Kin. The novels of the Half-Light City fall into the category of “buy and devour immediately” for me. Strong and complex world building, emotionally layered relationships, and enough action to keep me up long past my bedtime, I want to know what’s going to happen next for the DuCaines and their chosen partners, and I want to know now. Yes! This is one of my favorite series. And I love the cover art. It’s why I buy the paperback rather than the ebook version. So pretty. I hate old fashioned views on women! hehe but still that cover is enough to make me want to check out the first book!